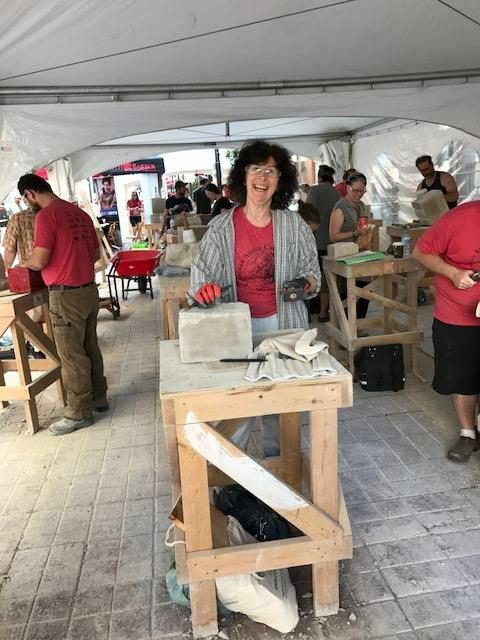 Starting with 12” x 12” x 8” blocks of Indiana limestone (100 lbs) Friday at noon, James Cook, Sheree Bradford Lea and Patrick Imai have carved Friday until 5 or 6 pm, Saturday 8 am – 5 or 6 pm, and will carve Sunday 8 am – 1 or 2 pm. Then Sunday afternoon the finished pieces will be auctioned (everyone is welcome) to raise money for the Ottawa Innercity Ministries. A great event to watch and a chance to talk to the artists and stonemasons about their craft.